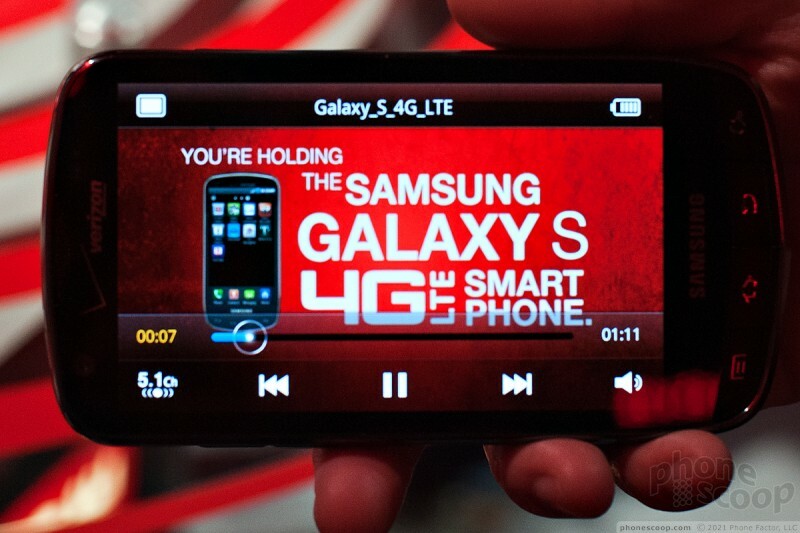 Hands-On: Samsung LTE 4G smartphone. 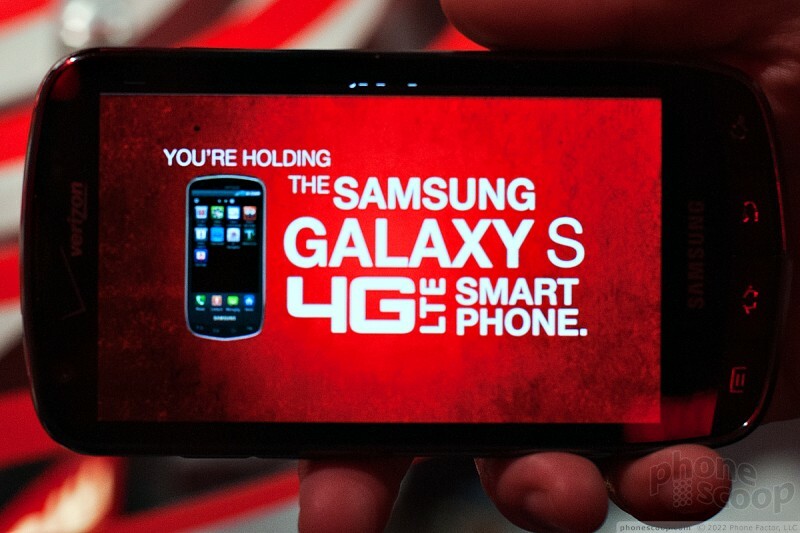 Samsung's baby is so new, it hasn't even been named yet, so we'll just call it the LTE 4G smartphone. 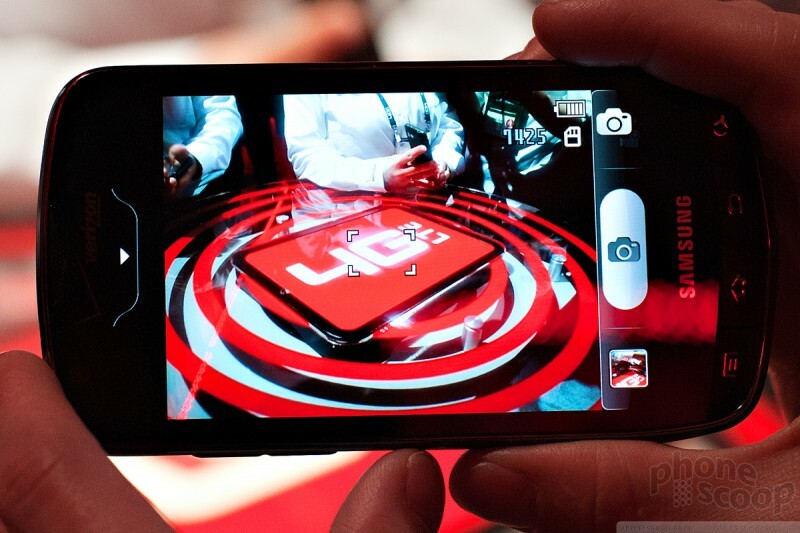 We got hands-on time with the new phone at Verizon Wireless' CES press conference. 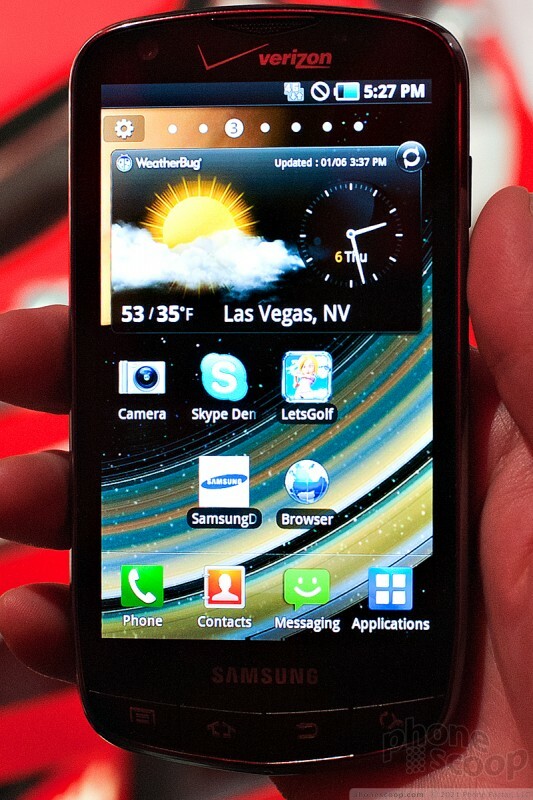 Of all the LTE smartphones Verizon Wireless was showing at its CES press conference, the Samsung device seems the furthest from being complete. It wasn't just the lack of a brand name. The interface was very bare, though it is already leaning toward the newest Samsung TouchWIZ designs also found on the Samsung Galaxy phones, like the Samsung Fascinate on Verizon. Many of the key features also did not work. The Web browser was not able to load pages. 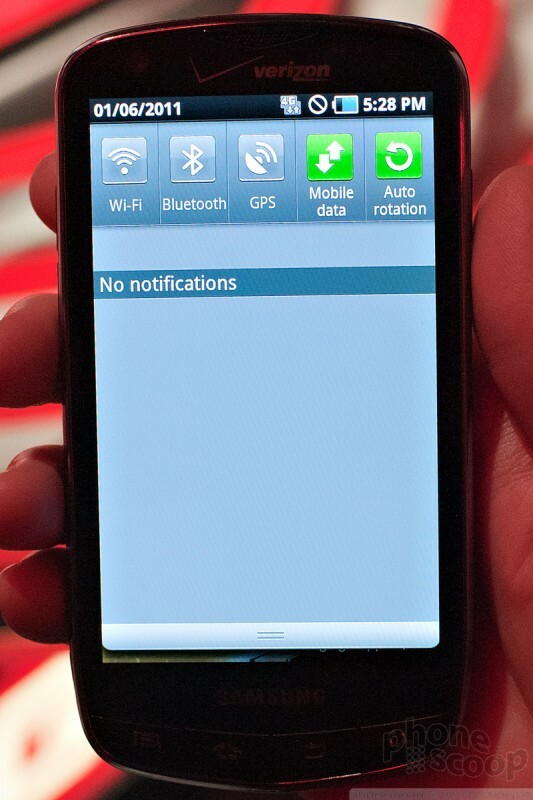 In fact, the notification bar up top did not report 4G network access during my test run. Also, the phone did not have the NFL Mobile app to watch streaming video clips. Many of the other apps were simply demonstration videos. The Skype demo gave a good idea of what Skype will look like, but it was a self-piloting demo video, and not an actual app. The hardware itself looked good and near-final, but there were still some bits that need polish. There seemed to be a gap between the hardware keys below the screen. 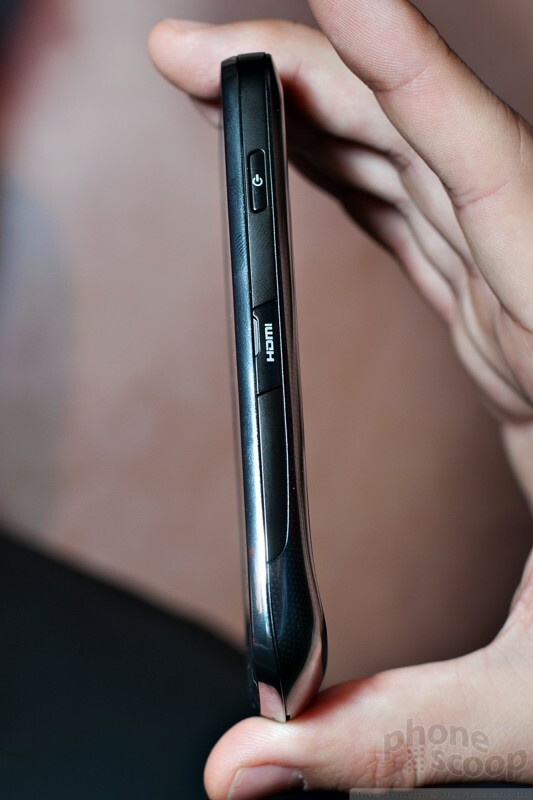 The phone looked nice, especially with the unique tapered edge at the bottom, a slight departure from the black monolith style to which Samsung and almost every other smartphone manufacturer hews. 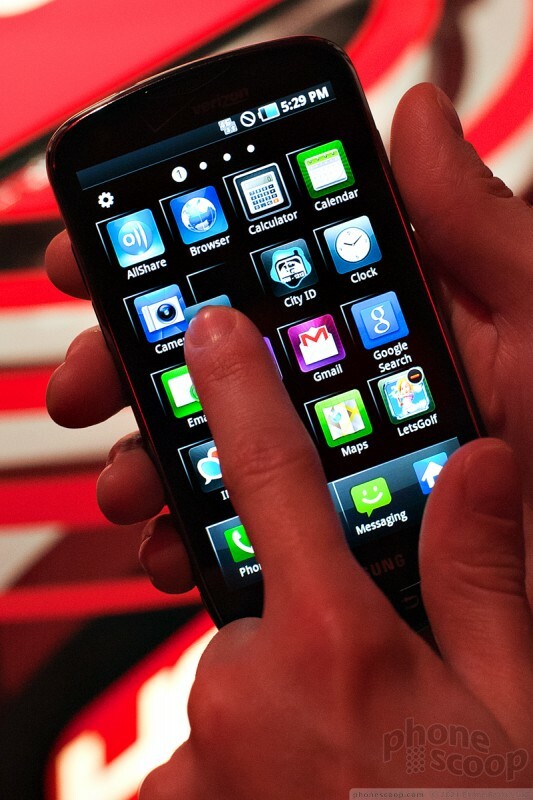 Even though I wasn't able to see much of the phone in action, there are still plenty of interesting tidbits to report. 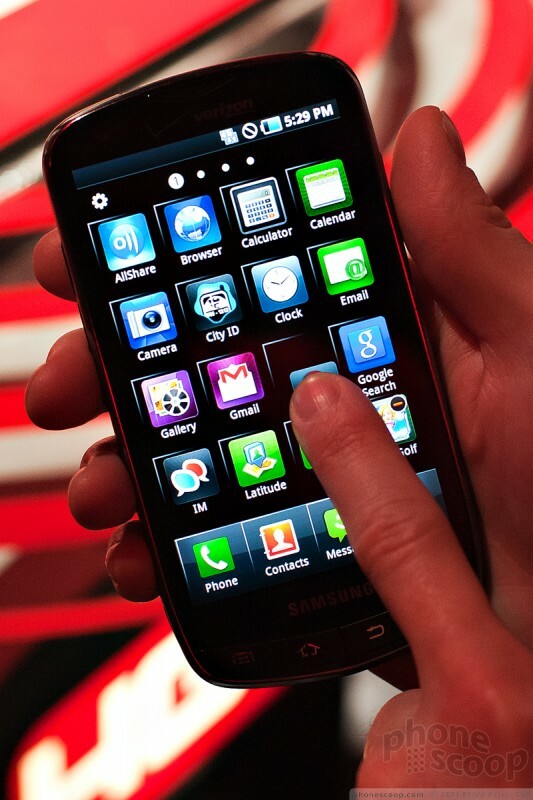 The phone is the first I've seen to use Samsung's latest Super AMOLED Plus screen technology. 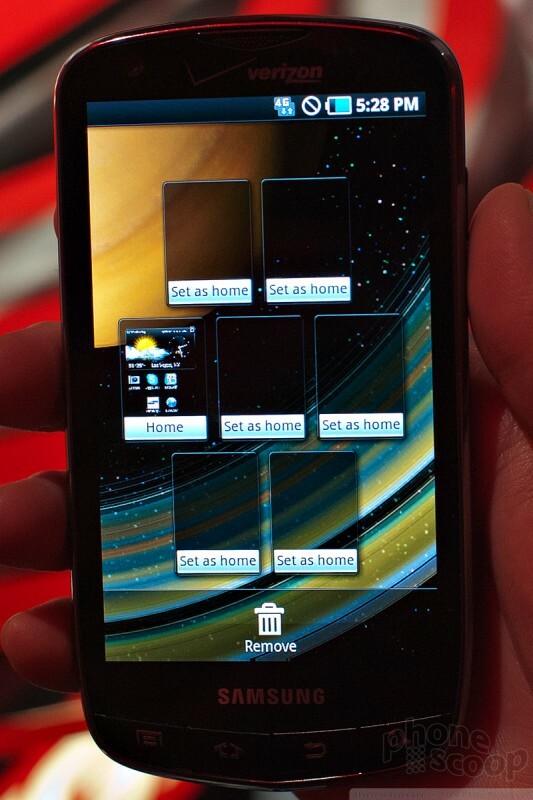 Samsung's screens just get better and better. 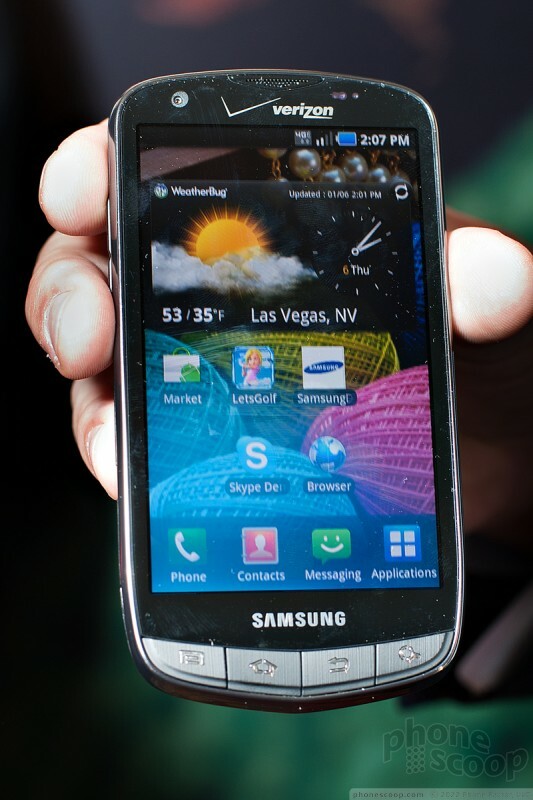 With an sAMOLED Nexus S in hand, the new Samsung prototype looks even better than Samsung's currently shipping top of the line display. Reps say the sAMOLED+ screen uses 50% more sub-pixels than a standard LCD screen, though I'd need a microscope to verify this claim. 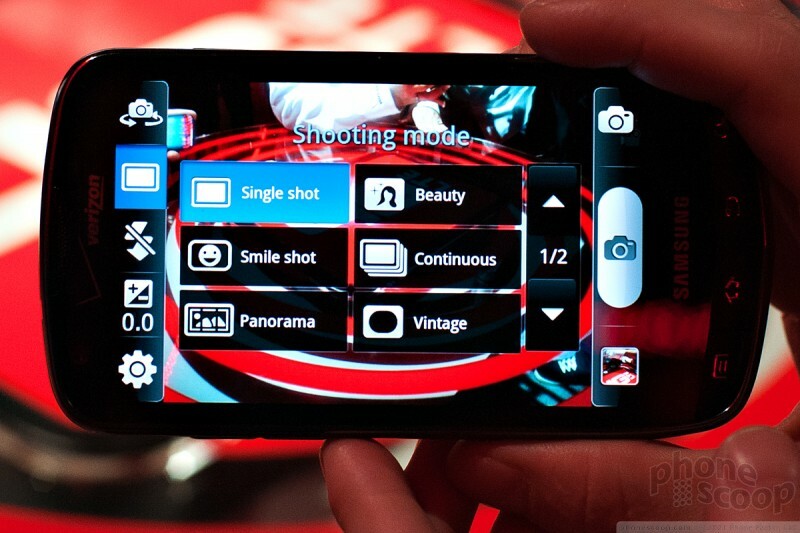 The phone has an 8-megapixel camera around back and a 1.3-megapixel camera up front. That's large on both counts, especially for Samsung, a company that is usually more conservative with smartphone cameras. Hopefully that 1.3-MP camera up front will equate to high-definition video conferencing. Reps seemed unsure if Swype would support high-res video calls. Pricing and availability details were unavailable, but the phone should go on sale by the middle of this year. Hopefully Samsung will come up with a cool name by then. Verizon's second Long Term Evolution 4G phone, the Samsung Droid Charge, is a huge, spaceship-sized device that represents all the promise of things to come. Does it fulfill those promises? In the wake of its courtroom victory against Samsung, Apple today asked the court to ban sales of eight Samsung devices found to infringe on its design and other patents. 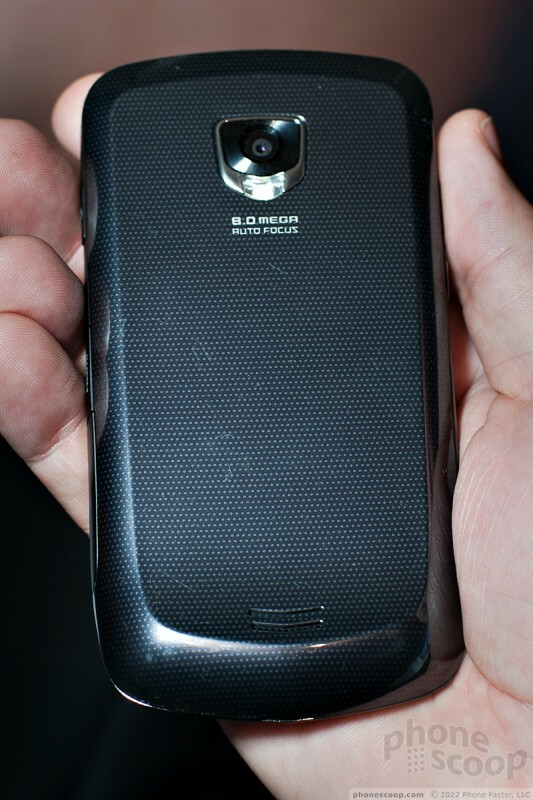 The devices include the Galaxy S 4G, S2 (AT&T and T-Mobile), S2 Skyrocket, S2 Epic 4G, S Showcase, Droid Charge, and Galaxy Prevail. Verizon Wireless today indicated that it will begin pushing a system update to the Samsung Droid Charge in the coming days. 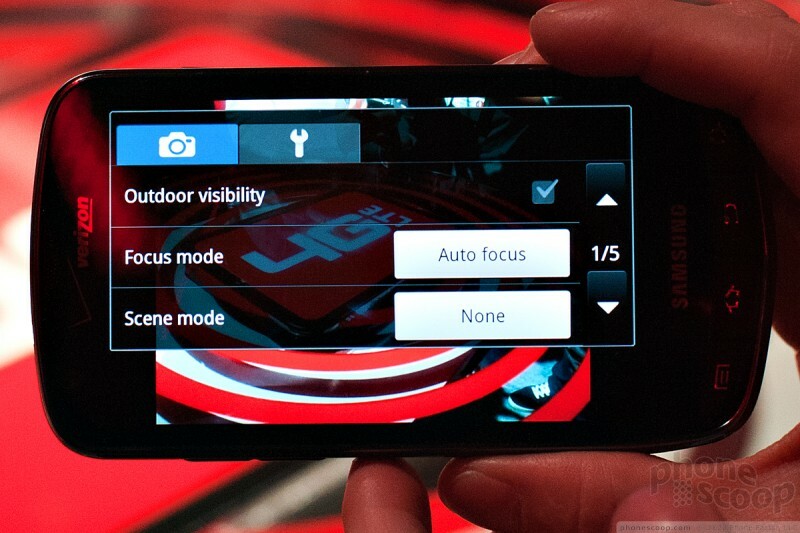 The update will add the same remote diagnostics tool that Verizon recently delivered to the LG Revolution. Skype has provided an update to its Android application that adds the video chatting feature to a large number of new Android handsets. Skype notes that Gingerbread is required to use the video chat feature, so owners of the following phones are encouraged to make sure their system is up to date. Verizon Wireless is offering a new system update to the Samsung Droid Charge that fixes a number of issues, including restoration of the mobile hotspot feature (which was knocked out in May). Other improvements include better battery life, better management of 4G/3G data connections, improved GPS and browser performance, and improvements to the email program's Exchange and folder support. It's got TouchPISS - Ugh! Either improve it or just put stock Android! Since it's got TouchPISS, they're probably using their own stupid file system called RFS = Retarded File System which slows things down and implements a lag. It's on Verizon - Blah! Who cares about their stinkin network when they'll be charging up the a$$ for it. Not to mention their plans are the most expensive! Screen looks better than ever even in photos! SamSUCK actually put physical menu keys this time! Nice. 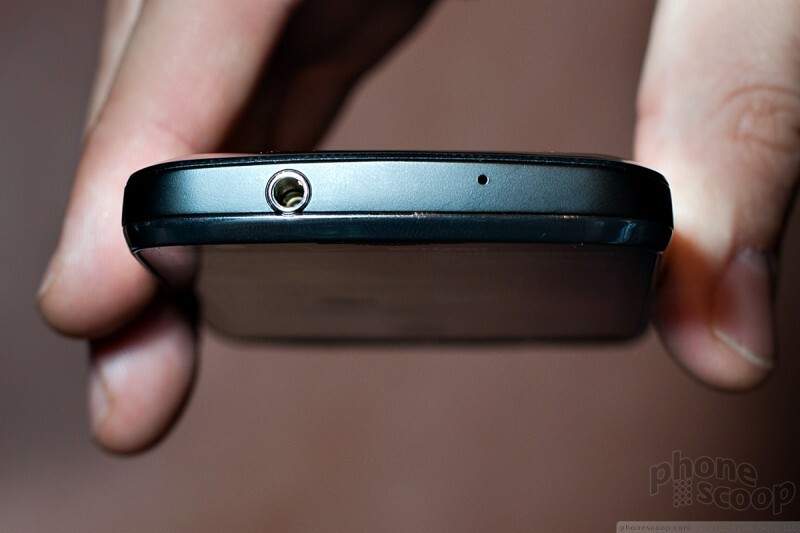 I was never a fan of the capacitive touch buttons on the Galaxy S line. Wow! Bitter aren't we? Yeah, Verizon is pricey as hell but what does that have to do with the price of tea...? I am not a fan of Samsung either. I much prefer HTC. This post just seems a bit over-the-top.